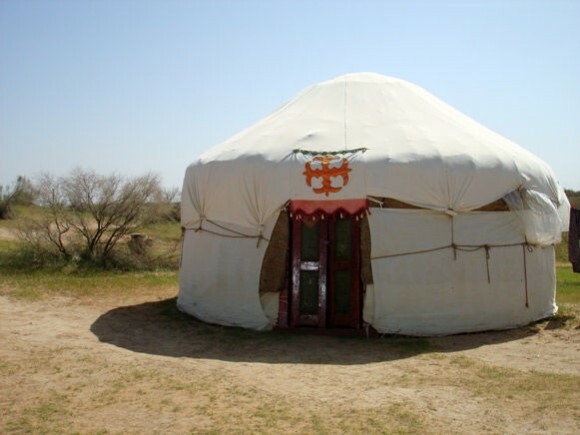 Explore the ancient sights from the time of Alexander Great, stay in the Yurt camp and explore the desert landscape walking around the dunes with this 2 days desert yurt camp tour. 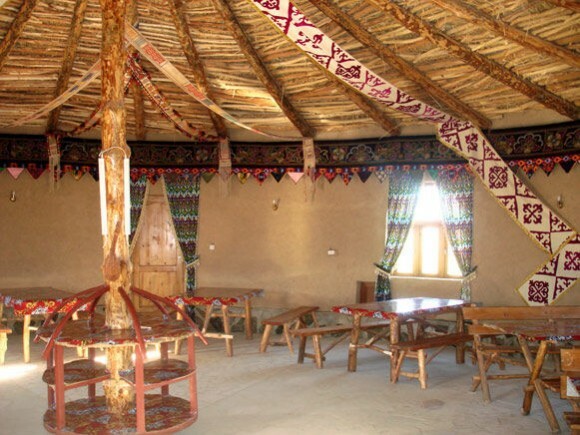 During this yurt camp tour you can take a walk to the desert village ‘Dungalak’ (4 km / one way) to get to know the daily livelihood activities and land use practices of the desert inhabitants. 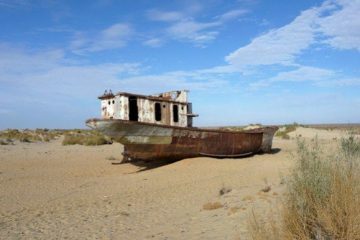 Ride on the camel or drive by car to explore countries largest man-made Lake Aydarkul located 8 km to the south-east from the Yurt camp. 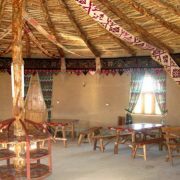 You will also enjoy the evening around the camp fire listening to the traditional songs of local bard. Visit Alexander the Great’s fortress ruins, holly spring and mosques in Nurata city. 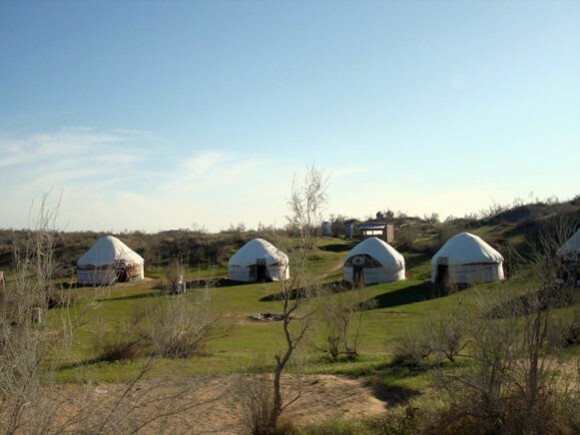 Ride on the camel, admire the desert landscape and stay overnight in the Yurt Camp. In the evening listen to the music performance around the fire. 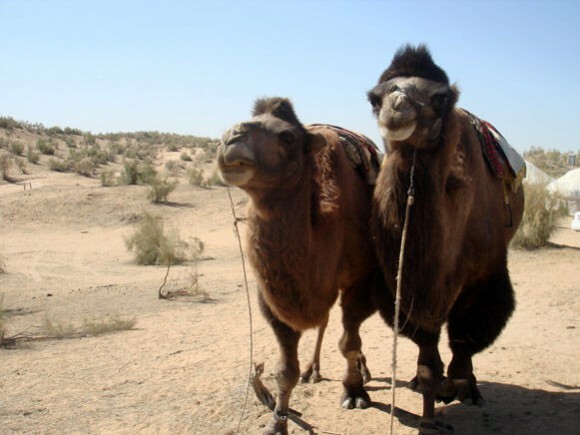 Take a walk to the nearby village of ‘Dungalak’ to learn about the life of desert inhabitants. 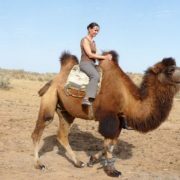 Drive by car or ride on the camels to the lake Aydarkul. Swim or stroll along the lake shores. In the afternoon drive to Samarkand/Bukhara. 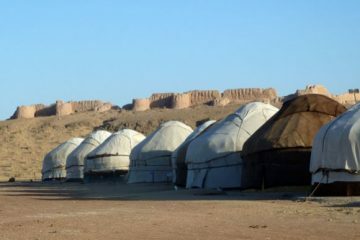 9:00 Depart Bukhara /Samarkand for the desert Yurt Camp located near the village of Dungalak (total 5 hours of drive). On the way to the camp make a stopover in Nurata city to have a lunch in local family’s house and visit some local sights (ruins of Alexander the Greats fortress, holly spring, mosque). Arrive in Nurata and have lunch with local family. After lunch, start sightseeing in Nurata. There are many legends related to the origin of the city and its name. People refer the origin of the city to the fortress ‘Nur’, founded there in the 3rd century BC by Alexander the Great. However, according to archaeological excavations the cultural layer in this area reaches the age of 40 thousand years. Supposedly, the main reason to choose this place as a settlement was holly “Chashma” (spring). 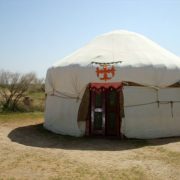 Visit the 9th century mausoleum, mosque and the remains of the Alexander the Great’s fortress. 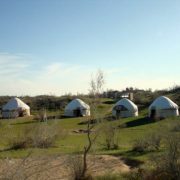 Continue to the Yurt camp (65 km / 1 hour).Arrive and settle in the yurt camp. 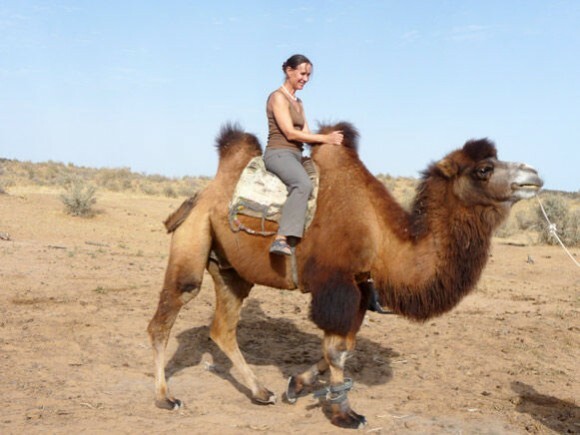 In the evening, ride on the camel or just walk around the dunes. You might be lucky to spot steppe tortoises, hares and desert agamas depending on the season. Dinner. You may also listen to the songs of local bard around the fire. 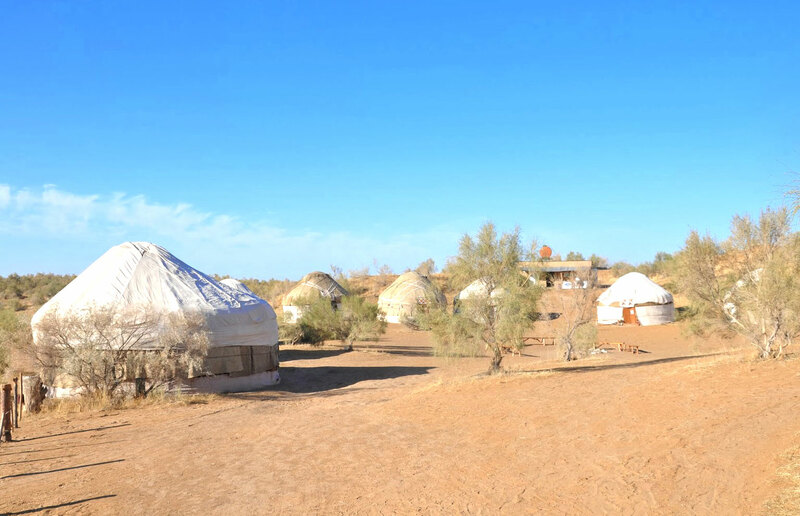 After breakfast, you may drive or walk to the nearby desert village Dungalak (4km) to get familiar with the life of village people who mainly live on livestock and sheep farming. 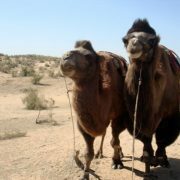 After visiting the village, drive by car or ride on the camels (additional 20$ per camel) from the camp to the lake Aydarkul located at 8 kilometers (3h) to the south –east. 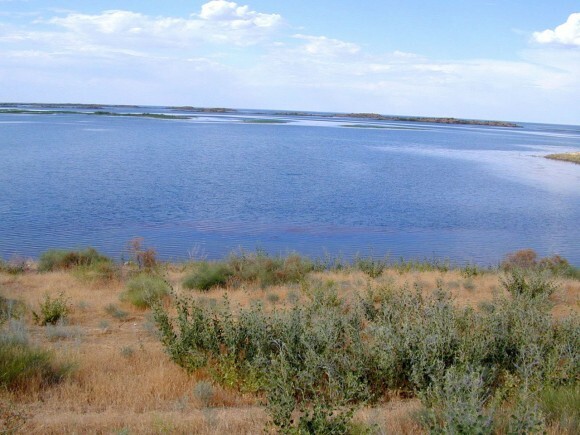 Aydarkul is an artificial salty lake that stretches 180km to the east, being the largest wetland body in the area it is home to many aquatic birds such as cranes, pelicans, numerous waders, many duck and goose species.Picnic at the lake. 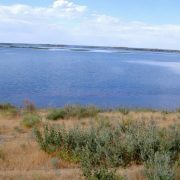 Depending on the season you can have a swim or just stroll along the lake shores watching the bird life at the lake. 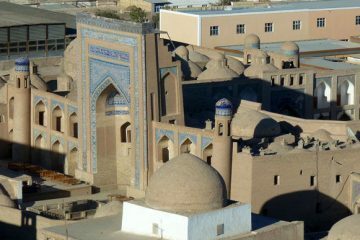 In the afternoon transfer to Samarkand/Bukhara (5 hours of drive).